6G, x8 PCIe 2.0 interface, 2xSFF-8088 external ports, Supports RAID 0, 1, 4, 5, 6, 10, 40, 50, 60 and dvraid. 512mb cache. Windows and Mac driver support. 3 year warranty. ATTO ExpressSAS 6Gb/s SAS/SATA RAID Adapters add high-performance RAID protection to direct attached SAS and SATA JBOD storage. 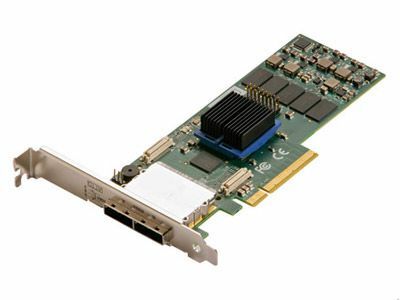 Delivering significant advancements in performance and flexibility with enterprise-class features, ExpressSAS 6Gb/s SAS/SATA RAID adapters provide an affordable and reliable transition from 3Gb/s to 6Gb/s SAS/SATA storage infrastructures in general IT and media and entertainment environments.